One of the things I love about being a godmother is that I get to introduce my godchildren to new experiences, things that they would otherwise maybe not have the opportunity to try. Even I was apprehensive, though, when I decided to take my five year old godson camping for the first time in summer 2010. As a child who’d spent his whole life in the city, I don’t think he had any concept of what camping was, and I wasn’t sure if he’d love it or want to come home after five minutes. So I decided to test the water by starting with just a one night pitch at somewhere far enough away from Cardiff to make it an adventure, but close enough that we could drive home if it all went wrong. I spoke to his other godmother, who suggested we meet her and her two nephews in Whitesands, Pembrokeshire. I’m embarrassed to say that, in all the time I’d been living in Wales, the furthest west I’d travelled was Swansea, so it was going to be an adventure for both of us. A better spot for camping could not have been recommended for us. 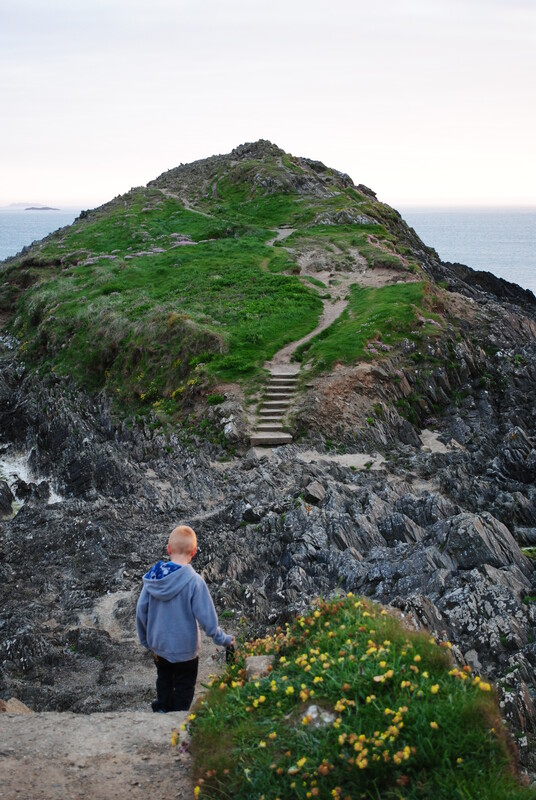 Whitesands, as with most of West Wales, is off the beaten track. You’re not going to trip over it by accident, so only people who know it’s there tend to visit. If it’s luxury camping and great facilities you’re after, then you’re probably better off staying in one of the bigger sites closer to Tenby. If, however, you’re happy to rough it a bit, then I’d definitely recommend the drive out to Whitesands. No matter how busy the traffic gets in the summer, and don’t underestimate how popular the beaches of West Wales are, the roads down to the coast will never be more than a single track. So be prepared for a slow journey once you leave the main road, and watch out for pedestrians, cyclists, kids racing on scooters and everyone else who uses the roads. The directions I was given to find the campsite were ‘drive west until you can’t go any further, and when you see the two white houses, the campsite is on your right’. Believe it or not, I found it first time. If you like more precise directions, though, from St Davids follow the Whitesands signs on the A487, and then turn left onto the B4583. If you can’t be parted from your sat-nav, the postcode is SA62 6PS. If you do experience any road rage from battling with all the other road users on the drive down to Whitesands, it will soon disappear when you catch the first glimpse of the beach in front of you. 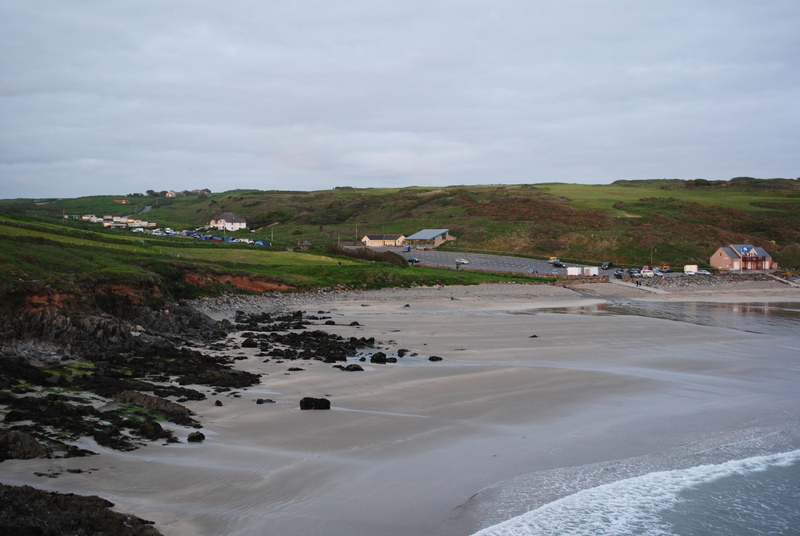 As the campsite is situated virtually on the beach as well, everyone has a room with a view. And it’s probably the cheapest sea-view in the world, as the owner only charges £5 per adult and £2.50 per child. In typical West Walian style, the campsite is run in a very relaxed manner. Pitch your tent wherever you want, and the owner will either come and find you, or you can pay at the parking booth. This is where you can also buy shower tokens and ask any questions you may have about the area. 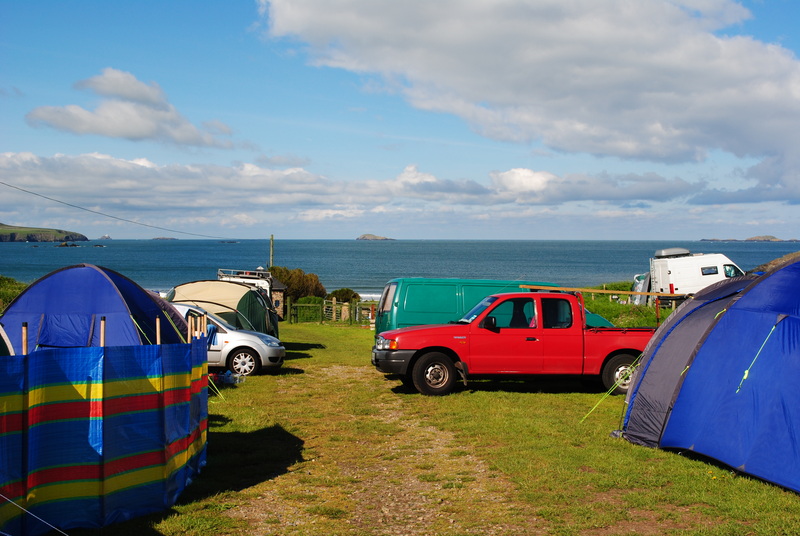 I’d recommend Whitesands campsite for any laid-back campers looking for a beautiful setting in which to relax and take in the beauty of West Wales. It’s so quaint that it made it into the ‘Cool Camping Wales’ book. When we first arrived at the campsite, there was some confusion over the difference between the tent and a sleeping bag. When I told him we sleep inside the sleeping bags which would be inside the tent, he looked at me like I was crazy. It’s only when I stopped and thought about it that I realised, when they’re packed up in the car, the tent and the sleeping bags are both actually the same size. My godson and I have been on lots of camping trips together since, and I hope they will continue until he’s too old and embarrassed to hang around with his aunty. Could be a scene from Australia…and we regularly camp with our “god children” – best mates kids! Previous PostPrevious Summer has arrived!